The self-paced Spare Parts Policy Development Training Course teaches you how-to develop a suite of spare parts inventory management policies that will ensure correct management and control of your spare parts inventory decision making. Building on a general understanding of spare parts inventory management and best practice this course shows you how to take that insight to create a suite of spare parts management policies. If you want a ‘classroom’ experience, we also provide this course in an instructor-led format. The instructor-led course includes our templates and guidance in developing your policies. Click here to read more. What spare parts management policies are and why they are important. The suite of key spare parts management policies and what each policy should contain. How to identify the the key performance indicators required for effective spare parts inventory management. The impact of long supply chains and how to improve performance in that circumstance. The key elements of a spare parts management system. The differences between single and multi-echelon systems and how this affects spare parts management. The process we used to identify best practices. The best practices that are shown to make a genuine difference to spare parts inventory management outcomes. 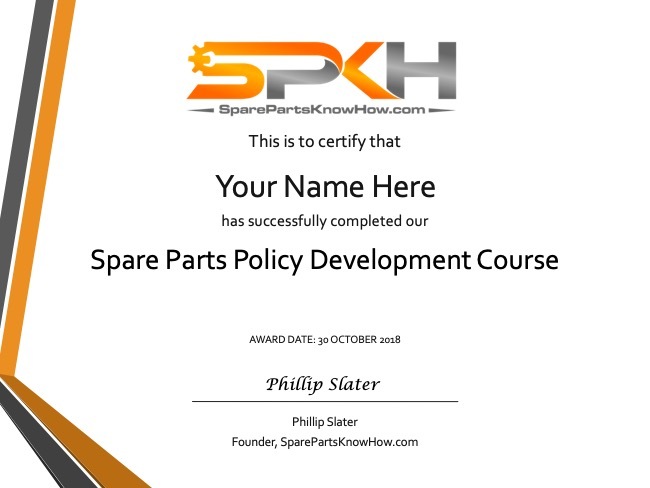 The self-paced Spare Parts Policy Development Training course is designed for those people who are specifically interested in the tactical issues of spare parts management. That is, establishing decision-making frameworks and guidelines for control. We recommend a minimum time commitment of 2.5 hours per week. Each module includes an online quiz. Successfully completing all four of the online quizzes leads to the award of our Spare Parts Policy Development Course certificate. We set the ‘pass’ level for these quizzes at 80%.